Walk out of Durham Castle, stroll to Palace Green Library – all of thirty seconds – and grab your seats in the Courtyard Café for two piano gigs. At 7:30pm Durham University student, Juliane Deil will be playing piano and singing numbers with her trio followed one hour later by Tyneside-based Paul Edis. To close the first night of this year’s DJazz head over to Empty Shop on Framwellgate Bridge to hear Early Nite (9:00pm) then at ten o’clock, making a return visit to Durham’s best kept secret venue, Belfast’s Robocobra Quartet will bring the curtain down sometime after eleven. Saturday, DJazz day two, begins at 12:30pm in Fowler’s Yard with Durham University’s Chronotic Brass playing a half hour set followed by the debut performance of the northeast based all-female Break Out Brass Band. Durham Uni students Rob and Evie sing at 2:30pm – they’ve been known to sing a few numbers at the DU Jazz Soc jam sessions – and an hour later Durham Uni hipsters Terminally Chill will be chilling out, hopefully under a blazing sun. The last session of the afternoon in Back Silver Street (5:00pm) features the increasingly busy hard bop sextet Alter Ego. Gypsy jazz and standards will be on the menu at the Courtyard Café courtesy of Andy Lawrenson. The violinist’s trio (bassist Paul Grainger is in the line-up) will swing into action at three o’clock. An hour later on Framwellgate Bridge the brilliant Francis Tulip Quartet makes a return visit to Empty Shop. Guitarist Tulip will be home from Birmingham Conservatoire, ace drummer Matt MacKellar flies in from Berklee, bassist Michael Dunlop will be up from London and pianist Joel Brown jets in from sunny Whitley Bay. Don’t miss this one. Highly recommended. Five o’clock, make a dash to hear Julija Jacenaite sing in Claypath Delicatessen, at six o’clock it’s the Leeds-based J Frisco at the Barber of Neville and at the same time at Redhills it’s Jambone. Sage Gateshead’s youth jazz big band has taken Coltrane-like giant steps in recent times and it’ll be a treat to hear the band in a fabulous venue. Redhills, otherwise known as Durham Miners’ Hall, is the place to be. And, don’t, please don’t, go anywhere. At 7:15 it’s the Soweto Kinch Trio. 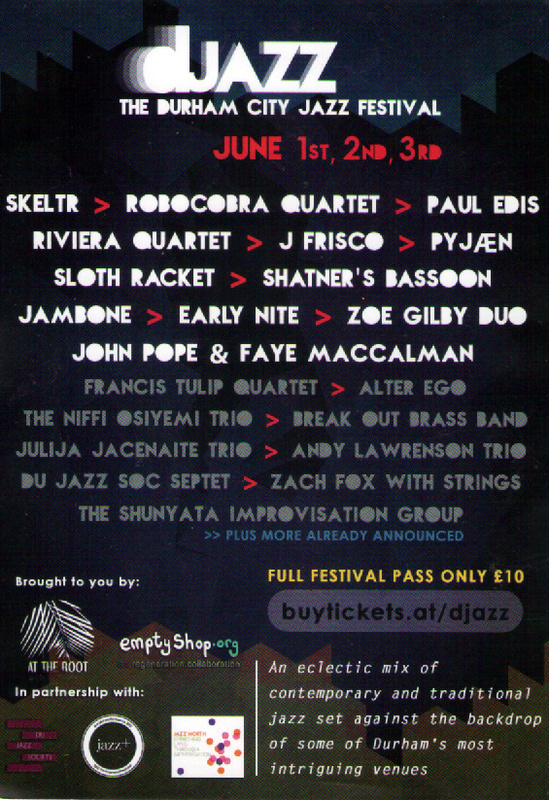 Yes, that’s right, the brilliant Soweto Kinch tops the bill. Quite a coup for DJazz! Alto players will/should be in the front row. Dan Garel, DU Jazz Soc’s Main Man will be there, that’s for sure. Unmissable. For those wanting more – there is more! – it’s all back to Jam Jah (that’s Alington House on North Bailey) but, but, but, don’t forget that you can take a spin along La Grande Corniche on the French Riviera listening to Pete Tanton’s superb Riviera Quartet. Well, Empty Shop doesn’t resemble the Côte d’Azur, but it’ll do. Downbeat at 9:15. So, to Saturday’s party-like finale on North Bailey. The Poetry Experiment begins at 8:30, at nine it’s PYJAEN, at ten…woah! – it’s the North East Super Jam. Yes, Newcastle’s legendary Jazz Café jam session will be linking up with DU Jazz Soc’s jam session regulars. The phrase ‘blowing the roof off’ could well apply to this one! Later, at midnight, it’s the Jam Jah After Party. That’s two days down, one to go. Sunday, DJazz day three, opens at the festival hub in Fowler’s Yard. Student band WTFunk? Get things under way at noon – let’s hope the weather forecast is good – followed by alto saxophonist Zach Fox with Strings. Over the last couple of years Zach has emerged as a key figure in the DU Jazz Soc jam sessions at Empty Shop having made a big first impression at the Great North Big Band Jazz Festival in 2017. At three o’clock Newcastle Jazz Co-op’s ‘mover and shaker’ Debra Milne will take to the stage with regular musical partner, guitarist Steve Glendinning and, at 4:30, effervescent singer Niffi Osiyemi will shake it up with her trio. The People’s Bookshop in Saddler’s Yard presents a leftfield offering. Starting at one o’clock and scheduled to run ’til four you will find the Shunyata Improvisation Group. This event could be one ‘gig’ that you’ll be able to dip into and out of – go for a pint, perhaps a curry, return two hours later and see how they’re getting on! Haircut Sir?! Why not join bassist John Pope (last seen sporting a crew cut) and Faye MacCalman (reeds) in the bijou Barber of Neville barber shop? They’ll be there, making a noise, if not having a trim, from 5:15pm. Speaking of making a noise…Niffi will certainly be doing that in Fowler’s Yard and at the same time in Empty Shop Shatner’s Bassoon will be doing likewise. This gig is likely to be busy – best to think of it as an all-standing affair. Back in Fowler’s Yard (6:00pm) organist (and pianist) Stu Collingwood will be pushing the pedals as the inimitable Mo Scott hollers the blues with maybe a little bit of Billie Holiday. Sunday evening is spread across four venues. At seven in Empty Shop there is a potentially very good session featuring a/the DU Jazz Soc Septet. One to get to. At eight o’clock it’s a toss-up. The much-hyped Sloth Racket (familiar to Tyneside audiences) rock up at Fowler’s Yard, meanwhile at the Old Cinema Laundrette in Gilesgate pianist Alan Glen will be playing modern jazz and as usual Maestro Glen will have with him John Pope, double bass, and drummer Paul Wight. Will they take the opportunity to wash their smalls? At nine o’clock make a b-line for North Bailey in the shadow of Durham Cathedral. At Alington House – it’s an unprepossessing building, you could easily walk past the door! – from nine o’clock it’s RAB followed at ten by the duo Skeltr. That’s Sam Healey (saxophones, keyboards, electronics), formerly of Beats and Pieces Big Band, and drummer Craig Hanson. The place will be packed. And that’s it ’til 2019. DJazz: The Durham City Jazz Festival is a collaboration between At the Root, Empty Shop and Durham University Jazz Society. Tickets cost £10 for the weekend. Day tickets won’t be on sale, nor will there be separate admission prices to individual events. A tenner gains you admission to thirty-three gigs – the bargain of the century!